ASKER (VG): The Norwegian flag in black and white with “diamond dust”. Magne Furuholmen checks out his new edition of the flag at Galleri TRAFO, behind the railway station in Asker. “The new Norwegian flag! Oil and diamonds! Isn’t that more appropriate for Norway now? 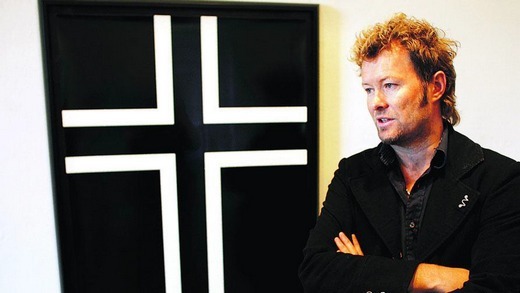 Especially in these times of financial crisis”, Magne Furuholmen says. 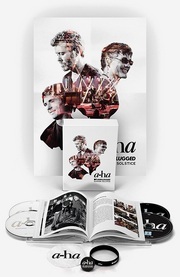 He’s back home in Norway, taking a few days break from recording the new a-ha album in New York. Together with Damien Hirst, Peter Blake, Banksy, Gavin Turk and Unni Askeland, Magne will be part of a small exhibition in one of the smaller rooms at Galleri TRAFO, which opens an exhibition of Andy Warhol this weekend. The room is a tribute to Warhol. “In a way, I’m challenging the national way of looking at things, when I have worked on the Norwegian flag in this way”, he admits. – Magne Furuholmen as a critic of society? Many have worked on the flag throughout the history of art. Many well-known American artists have done it, from Jasper Johns to Faith Ringgold. “There’s a long tradition of taking on the flag as a subject, so I’m not doing anything groundbreaking, but it’s like in the celebratory speeches when people say that ‘much has been said about many, but not everything has been said about everyone’ “, he says. The image that Magne has called “Norwegian Flag” is a silk print. “This is the first time I’m making silk prints, which was typical for Andy Warhol. I have also used a technique that Warhol started doing, called “diamond dust”, which means that you add a mixture of glass dust and glue on top of the silk print itself”, he says. The “diamond dust” makes the prints shine. And the room contains prints by several well-known artists who have used this technique. “I have been so lucky, being the only Norwegian to have Paul Stolper as my gallerist in London. He has also been Damien Hirst’s gallerist. Stolper has made his artists explore Warhol’s old technique and make works with “diamond dust”. I would probably never have made such a print, if it hadn’t been for Stolper. So the fact that I have been in London and met other artists has definitely influenced me and my identity as an artist”, he says. – Why are you taking part in this tribute to Warhol? “My new, Norwegian flag has already been shown in Basel, Copenhagen and is currently on display in New York. So it’s a bit coincidental that I have made such a print that happened to fit in connection with this Andy Warhol exhibition. But it’s great to be part of this, since Galleri TRAFO is also my gallerist in Norway. Warhol started doing his pop art around the time I was born, so the art I have made previously hasn’t been anywhere near pop art and Warhol, but I have perhaps gotten closer to it. If you’re going to work with art today, it’s difficult not to have some sort of relation to pop art”, he says. From VG, 31 October 2008.